Words you do not want to hear – I Am Not Ashamed Of The Gospel Of Christ! How many in the name of religion continue to do opposite of what is right,but sadly such a one will hear words from the Lord they never thought they would, such as get away from me I never knew you who work iniquity (Matthew 7:17-23). 17 Even so every good tree bringeth forth good fruit; but a corrupt tree bringeth forth evil fruit.18 A good tree cannot bring forth evil fruit, neither can a corrupt tree bring forth good fruit.19 Every tree that bringeth not forth good fruit is hewn down, and cast into the fire.20 Wherefore by their fruits ye shall know them.21 Not every one that saith unto me, Lord, Lord, shall enter into the kingdom of heaven; but he that doeth the will of my Father which is in heaven.22 Many will say to me in that day, Lord, Lord, have we not prophesied in thy name? and in thy name have cast out devils? 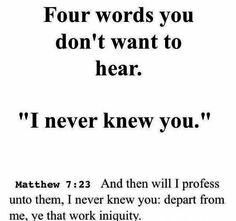 and in thy name done many wonderful works?23 And then will I profess unto them, I never knew you: depart from me, ye that work iniquity.